For six hundred years Pern prospered under the protection of AVIAS. The seasons came and went, the crops grew and were harvested and the population flourished. Undisturbed by the threat of thread fall technology and medicine advanced in dragon lengths. Basic steam powered machinery emerged and previously mortal wounds are now treatable. However the paradise was a short lived dream. Not long after the failed testing of a steam powered airship the sweet fruit of life turned sour. A dragon hatching that occurred a short time afterwards both shocked and devastated the weyrs and holds. The freshly hatched dragonets turned on each other, ripping their siblings apart with unbridled violence before shockingly turning on the candidates. With the sands soaked in ichor and blood, the weyr hoped it would be a freak event never to repeat. Their hope was in vain and hatchings quickly built the reputation of being a slaughter. The affliction didn’t stop at the new born however. A short time after, the madness began to affect mature dragons who turned on their fellows and most unnervingly, their riders. The only respite to this nightmare was that those infected died no longer than a month after symptoms emerged. Within three months the entire dragon population was destroyed and pern held its breath in apprehension of the next bloodshed, but when none occurred everyone heaved a sigh of relief. Mercifully whers and firelizards appeared immune to the affliction and prospered. The reprieve was to be short lived however as AVIAS unexplainably failed and thread once more rained death on Pern’s land. This time there were no dragons to paint the skies in green, blue, brown, bronze and gold, instead the whers and the firelizards inherited the responsibility. For fifty long turns the dragon cousins protected the world, however their population was devastated in the process. Over two hundred turns later while the whers and firelizards are still struggling to recover the wind carried the sound of great wing beats and the horizon winked with dragon hide lead by a huge golden queen, larger than even the great Ramoth. The group counted six hundred in total with a vast clutch which she gave to Aterrima along with a small tithe of dragons to set up their own weyr. However nothing is as it was and the weyr was forced to steal candidates as those that volunteered were few and far between, the haunting story of the madness plague still fresh among the holders. Miraculously Aterrima gathered enough for their first hatching but it would once more be bathed in blood. The first dragonets hatched healthy and strong, bonding quickly however a male hatched his hide painted with the colours of a deep sunset, unlike anything ever seen before. Kaltith became enraged at the sight of it and attacked the clutch aiming for the purple and gold hatchling. The queen egg broke and the gold saved her brother from the blow but was killed in the process. Unfortunately this would not be the only injury suffered by Aterrima, as the weyr still reeled from the loss of their gold Rimeth, Kaltith sent her dragons to steal the candidates from Aterrima for Kaltith’s new clutch. Powerless to respond openly the Aterrima riders waited and plotted. For five seven days they bided their time. It wasn’t until they joined forces with a rogue group of whers that they made their move; infiltrating Telgar and making off with a 23 of Kaltith's eggs. Kaltith was angrier than ever, but did not pursue. Instead she gave Aterrima a grace period, of sorts. On the first day of Spring, Aterrima and Telgar will be at war. Not long after they arrived, the eggs hatched and a new colour was revealed. 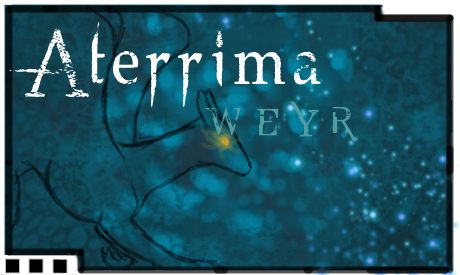 Gold Ullrith has announced that Abandoned Weyr is her home, and that Aterrima can keep their Beryl - she will not follow. So now the Aterrimans face a difficult choice. Do they hope that their Beryl really is a Queen? Or do they stay with Ullrith, who, for all her youth, appears to be similar to Kaltith in more ways than her hide? Five non-canon colors have been introduced with Aterrima's first hatching, and a sixth in the second! Non sexuality based impression. Female riders may ride everything but bronze, males anything but gold. Some adult rider positions are still available! Weyrling dragons are also available for adoption! Plenty of clutches of all kinds are in the works - New Members will also receive a randomised Firelizard!